There is no doubt what this election is about for the Conservatives. Theresa May has repeated "strong and stable" and it does not seem as though she will stop any time soon. The prime minister is determined to make this election about Brexit and how a vote for the Tories means a vote for her to have a "strong hand" at the negotiating table with the EU. An added dimension to this election is the potential for the Conservatives to make significant gains in Wales. Recent polling data from the Wales Governance Centre suggests the Conservatives may be on course to become the largest party in Wales, a huge electoral breakthrough which would see the Labour Party losing its position as the dominant party in Wales, which it has held since 1922. The significance of this was not lost on the Conservatives. 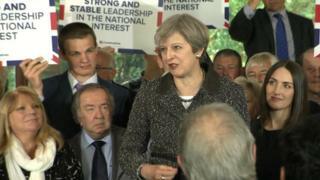 Almost immediately after the first piece of polling data suggested a Tory breakthrough, Theresa May held an event in Bridgend, a constituency high up in the party's targets in Wales. As noted by Prof Laura McAllister, losing Bridgend would be a symbolic blow for Welsh Labour as it is the assembly seat of First Minister Carwyn Jones. In order for the Conservatives to win seats like Bridgend, the party is determined to push the narrative of May vs Corbyn. The opinion polls do not reflect favourably on Labour's leader in Wales and Mrs May will be repeating mantras about "strong and stable" leadership and Mr Corbyn's potential "coalition of chaos". The repetition of these phrases is likely to draw groans every time they are used, but Mrs May is determined to hammer home the point that the choice is between her and Mr Corbyn on 8 June. This is being done to the extent that Welsh Conservative election posters focus on Theresa May and do not focus much on "Welsh" Conservatives. As well as attacking Mr Corbyn, this election is also being campaigned on Brexit. The mantra of "strong and stable leadership" in Brexit negotiations will appeal to those who want to see a tough stance towards the EU and it has already seen votes haemorrhaging from UKIP to the Conservatives. The Welsh Political Barometer survey for 5-7 May asked the question: "Which political party do you think would best handle Britain's exit from the EU?". The Conservatives were by far the most-trusted party in this regard. They will want to highlight this throughout the campaign. However, the Tories in Wales will have to battle against a Welsh Labour Party that has proved resilient in the face of difficult circumstances. Labour performed better than expected in the recent local elections and it will argue this was down to the "Welsh Labour" brand. It remains to be seen whether Welsh Labour's tactic to focus on Welsh issues and to try and shift the narrative away from May vs Corbyn will be effective, but the Conservatives need to be mindful of this. The party has been accused recently of imposing candidates on local parties, upsetting some local members. If Labour try to make this election about local issues, it may spell danger for the Tories: Labour will accuse Tory HQ of taking local voters for granted by imposing candidates with no links to the local area. Responding to the Conservative candidate selection in their constituency, a Labour candidate complained that "Tory candidate chosen by Theresa May & CCHQ means a puppet MP supporting the PM's hard Brexit no matter the cost to jobs, business and environment". They argued the election is a choice between "unrestrained Tory government or independent-minded local MPs". Theresa May and the Conservatives need to be careful that Welsh Labour are not able to change the narrative. Elections are never easy to predict and there is still time for opinion polls to shift and previous projections be deemed obsolete. But as we approach 8 June, there is the potential for this election to cause a huge change in the political map of Wales - a map turning from red to blue.